Udo Walther was born on July 2, 1947, in Furth, Germany, and he immigrated to the United States in 1956. He enlisted in the U.S. Army on October 12, 1964, and completed basic training and then Clerk School at Fort Polk, Louisiana, in February 1965, followed by Airborne School at Fort Benning, Georgia, in March 1965. His first assignment was as a clerk and then as an Infantry Operations and Intelligence Specialist with the 6th Special Forces Group at Fort Bragg, North Carolina, from March 1965 to April 1966, and then while enroute to Vietnam he was ordered back to Fort Bragg, where he served as an Operations Specialist with the 82nd Airborne Division from June 1966 to January 1967. Sgt Walther next completed Infantry Officer Candidate School at Fort Benning, and was commissioned a 2d Lt in the U.S. Army on August 4, 1967. After completing the Special Forces Officers Course at Fort Bragg, Lt Walther served as Commander of Detachment A-633 with Company C, 6th Special Forces Group at Fort Bragg from December 1967 to February 1968. His next assignment was as an Infantry Company Advisor with the 46th Special Forces Company in Thailand from March 1968 to March 1969, followed by service as Executive Officer and then Commanding Officer of Detachment A-245 with Company B, 5th Special Forces Group in South Vietnam from March to December 1969. Capt Walther served as S-3 of Detachment B-24 with Company B, 5th Special Forces Group, from December 1969 to February 1970, and then as Commanding Officer of Detachment A-242 with Company B, 5th Special Forces Group from February 1970 until he returned to the United States in June 1970. He then served as Commanding Officer of Detachment B-42 with Company D, 6th Special Forces Group at Fort Bragg from June 1970 to February 1971, and during this time he participated in the Son Tay Raid, a clandestine mission to rescue American Prisoners of War held in North Vietnam on November 21, 1970. During the raid, Captain Walther served as Commander of the Greenleaf Support Group, whose job it was to secure parts of the area and roads around the Son Tay compound, and to destroy the bridge over the Song Con River. He next served as Commanding Officer of Detachment A-435 attached to Company B of the 6th Special Forces Group at Fort Bragg from February to April 1971, and then as Executive Officer of Detachment B-23 with Company B, 5th Special Forces Group at Fort Bragg from April to August 1971. Capt Walther served as Commanding Officer of Detachment B-22 with Company B, 5th Special Forces Group from August to December 1971, followed by service as S-3 of Detachment B-462 with the 46th Special Forces Company in Thailand from February to April 1972. His next assignment was as Commanding Officer of Operational Detachment 12 with U.S. Army Special Forces Thailand from April to November 1972, and then as Commanding Officer of SFT 42 in Thailand from November 1972 until he returned to the United States in July 1973. 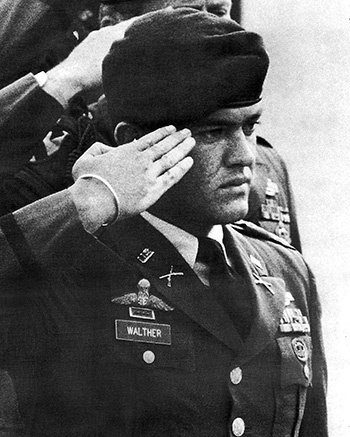 Capt Walther left active duty on August 3, 1973, and remained in the Army Reserve until March 13, 1979. Udo Walther died on October 5, 2013. For gallantry in action as Commander of the Support Group of an all-volunteer joint United States Army and Air Force raiding force, on 21 November 1970, and displayed outstanding leadership, personal courage, and presence of mind while leading his group in a heliborne assault mission to rescue and extract United States military personnel held prisoners of war at Son Tay prison, deep inside the sovereign territory of North Vietnam. This valiant effort was motivated by deep compassion for his imprisoned fellow men-at-arms, and by a strong sense of military duty and national pride. Upon reaching his first objective, Captain Walther realized his force had been landed in an area other than, but resembling, the target area. At this time the force was engaged by an enemy force armed with AK-47 rifles. Captain Walther unhesitatingly led his element into the compound, subduing this force with devastating and accurate fire. Upon being recalled to the landing zone, Captain Walther directed and participated in an orderly withdrawal under fire. His heroic actions and his disregard for his own personal safety were an inspiration to his men and officers. He completed an orderly extraction and was inserted into the target landing zone as originally planned. His masterful control of the Support Group was exemplary. His keen mind and his alertness to the changing situation allowed him to enter the target area and link up with and pass through the group which had earlier taken over his assigned area. His fearless conduct, his efficient and accurate executions of combat tasks, and his calm manner of performance under fire during the critical extraction phase reflect great credit upon himself and the United States Army.